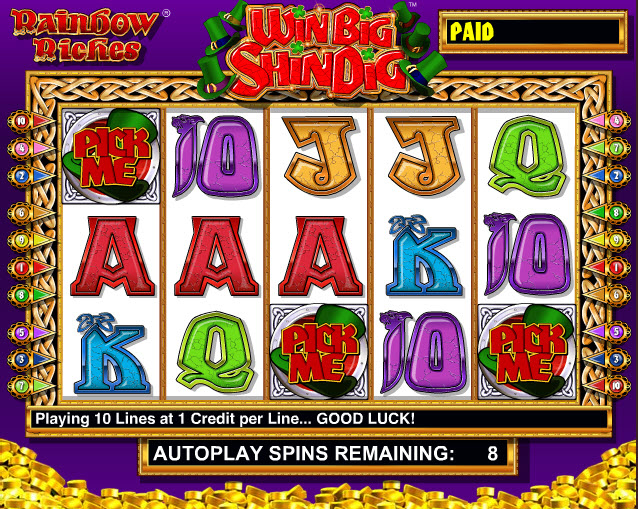 Rainbow Riches is currently one of the most popular fruit machines in high street bookmakers. Powered by popular fruit machine provider Barcrest, Rainbow Riches features 20 win lines and the option of betting from 1p to £20, giving you the chance to win anything from £400 to a massive £200,000 jackpot depending on your stake level! Play Rainbow Riches at Betfair Arcade. The online version of Rainbow Riches is easy to use and well laid out, combining bright graphics with fun sound effects to create an enjoyable playing experience for novice and more competent players alike. The game features five reels and both your stake per line and the number of lines you wish to play can be increased or decreased using the plus and minus buttons according to your preferences. There is also both a manual and autospin option, the latter of which can be set to run between 10 and 50 times until player intervention is required in game. This can be easily cancelled if you wish to recommence manual spins. One of the most exciting features of Rainbow Riches are the three bonus rounds available during play: Roads to Riches, Wishing Well and Pots of Gold. With three bonus round features, it’s easy to understand why Rainbow Riches is one of the most popular online fruit machines of all-time. This bonus is playable when either three, four or five of the leprechaun symbols are visible on the reels. Spinning the wheel will help you advance up the trail, earning ever bigger bonuses until the wheel lands on ‘collect’. Your total stake will then be multiplied by the bonus you earned. With multipliers ranging from x8 to x200, this bonus round truly gives you the chance of winning big. To play the Wishing Well, gain three wishing well emblems on your reels and you’ll get the chance to select one of the wells urging you to ‘pick me’. Each is hiding a different value of multiplier and, once you’ve made your choice, the multipliers will be revealed and your total stake will be increased by whichever you picked. This game can only be accessed by getting three pots of gold in view of the middle three reels. You will then be rewarded by spinning for the choice of a gold, silver or bronze pot, each with their own multiplier to increase your total stake by. Play Rainbow Riches at Sky Vegas – Click here to play now.